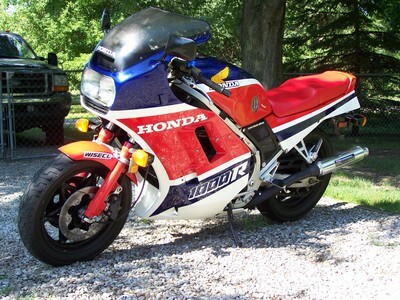 In March 1984 Honda introduced the VF1000RE in Europe. Its styling was a celebration of the V4's racing heritage and the VF1000R was a showcase for the technology Honda had developed on the track. 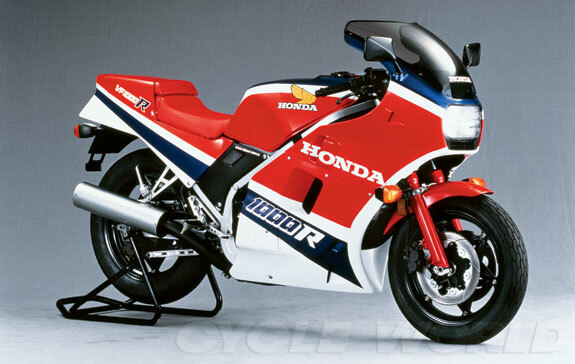 The super sports bike still featured the same 998 cc V-4 engine in its rectangular section pipe frame, but this was the first VF1000 to have gear driven cams that would become a trademark of future V4 Hondas, beginning with the VFR750. The VF1000R modifications increased the claimed output of the V4 engine to 122 bhp (91 kW) or 125bhp (American Release). The suspension system remains unchanged from the VF1000F but dual floating front discs and racing style piston calipers on the ventilated rear disc enhance the braking. The 16-inch (410 mm) front and 17-inch (430 mm) rear NS type aluminium ComStars came on quick-release axle holders, and other features included the endurance racer style twin headlights, adjustable clutch and front brake levers, full fiberglass racing fairing and solo seat cowl. The RE was discontinued in April 1985 to be replaced by the VF1000RF. The bike was redesigned (losing the twin headlights) to satisfy the American market who had to wait a year before the bike was sold in the USA. The RF was produced in the same colour scheme as the RE but with revised decals. In March 1986 the VF1000RG was introduced in the Rothmans Team colours with revised logo decals. This was discontinued in August 1987. Six months later, in February 1988, the VF1000RF was discontinued.